Email Ethics: May the force of email marketing be with you. 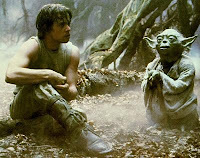 A long, long time ago in a galaxy far, far away, I met some M. Yoda, a funny looking email marketing guru, we talked for a while about email marketing and he gave me a list of advices on how to manage your marketing lists. These advices I already gave but on several posts, that's a good opportunity to aggregate a bit all of this. And remember, even if it's always tempting, don't ever slip on the dark side of the force. - The double agreement of your user to send email to them you need to have. - The unsubscribe process simple needs to be. - The targeting of your email wise it always has to be. - Irrelevant or offensive content sending, avoid you have to. - Always checking your sender reputation you need. - Analyzing the statistics always you have to. - Nice and clear your landing page has to be. - Whatever possible track you must. - Your Database cleanup you must once in a while. Even though his grammar is quite poor... I thought his advice was worth sharing with you.